The concept of drums are as old as mankind. A drum is called a membranophone, or an instrument that creates sound by striking a stretched membrane with some type of object, usually a rounded stick. Drums consist of a hollowed-out piece(called the body), a membrane stretched over the end of the drum, and tuning keys or pegs which tighten or loosen the membrane to achieve different tones. While most may think that the body of the drum produces the sound, it is in fact actually the membrane and its vibration that creates the sound when struck. 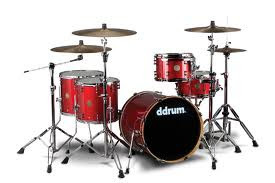 Drums first appeared as far back as 6000 BC. Mesopotamian excavations unearthed small cylindrical drums dated 3000 BC. Several wall markings found in caves in Peru show drums used in various aspects of societal life. The American Indians used gourd and wooden constructed drums for their rituals and ceremonies. Drums have always been used for more than merely creating music. Civil uses, messaging, and religious uses are but a few. African drumming is characterized by a rapid and complex rhythmic composition. This intense playing style of fast-paced and upbeat drum playing can be found in many of the drum playing of tribes all over the continents of Africa. In tribes, they serve a purpose to the local community and help in the conduct of daily routines. The beats and sounds of the drum are used in communication, as well as cultural expression. Drummers play together their separate rhythms clash and cross, but the main beats never coincide. This is an incredible feat as there are always two drummers and usually more than three. The drums can have the rhythmic pattern that they follow changed in mid-song. This adds to the complexity, as the master drummer in the ensemble can change the pattern he plays whenever he feels like it. The most important aspect of listening to the multiple drums play together is that the various composite patterns are heard in integration and not as isolated units. There is not supposed to be one drum that stands out like a lead drum or vocal. Each drum has its own part and rhythm to contribute and it is the sum of all these parts that create a complex and awesome sound unique to the drumming of the African continent.